Few years back we contemplated moving away from California, but I just could not make myself do it. Despite being aware of the risks of earthquakes, I still want to continue living here. Then a big earthquake came last weekend in the middle of the night right where we live and gave us a strong jolt. I cope best by drowning myself in work, so next morning I went into crisis mode and took care of everything methodically. However, I was shaken up nonetheless. Even though it still didn’t make me think of moving away, I needed a strong reminder of how much I love the parks and the land here. I had been planning on showing this little bear cub made by Pam Brown this week and, strangely enough, the timing could not have been more perfect. Talk about coincidence! 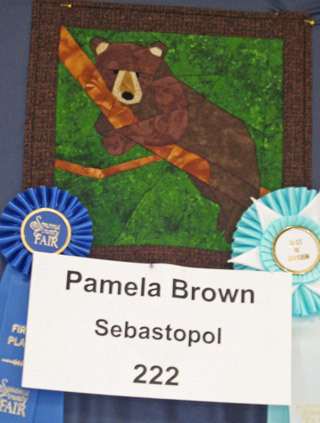 Pam made this wall hanging from my bear cub quilt pattern and entered it in the Sonoma County Fair. This darling little bear cub was entered in the theme celebrating the 150th Anniversary of the California State Parks and Smokey The Bear. Her bear won the 1st prize AND the Best of Section!! How amazing is that!! I told Pam that California Parks are very dear to me and I was thrilled to hear that she entered the bear cub in that theme. I can’t thank her enough for emailing me and reminding me that even though nature shakes us hard now and then, it also offers us a lot of happiness every way it can. The little bear cubs are part of my vivid memories of time spent in the California Parks. I am looking forward once again to enjoying the California outdoors that I love so much! We moved to this city earlier this year. I am so thankful for the kindness of everyone around here, the unexpected visits from people who came to check on us and the emails from my online friends. 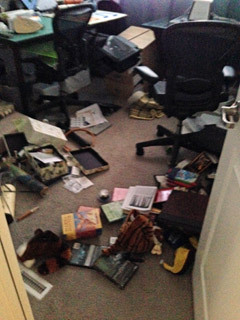 This was my sewing room after the quake. The room is put back to normal now and you would never know that the quake hit it this hard. I am actually sitting right inside this room while typing up this post, slowly trying to focus and get back to normalcy. I am not ready to sit at my sewing machine just yet. I have a few designs and hand sewing projects that I can work on and this wall hanging is amongst them. I still need to finish cleaning up the threads from the circles and then I need to hand sew the binding on it. I am working on a custom pattern for an extremely brave group of people – the Explosive Ordnance Disposal (EOD)/Bomb Squd, such a special project! 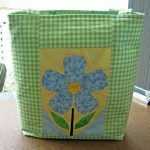 One of the many things that made me smile this week was The Sew Cute Tuesday Link Up at Blossom Heart Quilts. 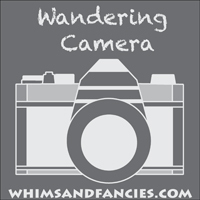 This is one of the first Linky Parties I joined and I am thrilled to be one of the guest hosts. Make sure to drop by there to see my Rock Music quilt top and three of my picks from the last week’s link-ups. I promise you will laugh out loud!! Have a very safe week, everyone! omgoodness. I can only imagine how long it would take me to feel comfortable again. 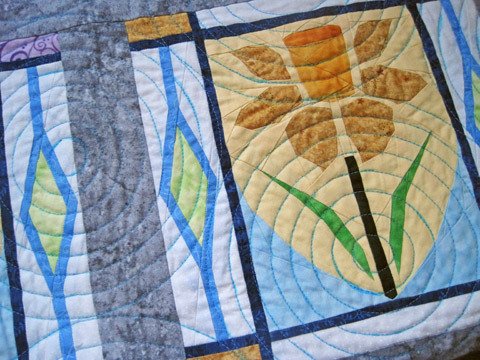 I agree that the circular quilting on that beautiful quilt with flowers is perfect. I will just have to scroll through because I want to see the rest of that project. I am sorry you had to deal with the earthquake. If your sewing room looked like that, I suppose every other room did too. I am happy to hear that you are ok.
Love the wall hanging you are working on. The circular echo quilting is such a compliment to that design. So glad to hear you and your family are okay. CA does have such beautiful parks and places I might one day get to visit. Glad you are ok after the quake. We have had a few little quakes here but has been some years – nothing to shake any thing off shelves tho! 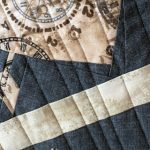 Your paper piecing patterns are sweet! I am so glad to hear that you’re okay! Marilyn had posted that the epicenter was near your home and I hadn’t been on the computer until yesterday… Your little bear pattern is so cute, and how appropriate that Pamela won first place using it!!! I want to take a deep breath for you and help you clean up your house! Hugs my friend! I made this in a small 12 inch wall hanging. I live in a assisted living facility and hang them on my door, all the residents enjoy my goodies, thanks for a great one. We heard about the earthquake here in Australia but I didn’t realise it was so close to you…very scary for you that’s for sure! 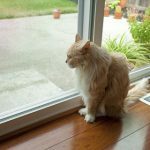 I visited your guest post and loved it! You are stronger than I would be Soma!! Love the sweet little bear. I am very thankful that you are safe. I know that it is difficult to move from some place you love. I now live in Oklahoma. There are many Native Americans that refuse to move from their families to go to college because of their closeness to family. It would give them the possibility of getting out of poverty and forever changing their lives and they simply cannot do it. I moved for my first job out of college and then was transferred within nine months to Oklahoma. Then I married a native Okie who refused to move. After he divorced me, I had children who were born and raised here. I was considering moving back to be with my mom after my daughter graduated from college. However, my mother died unexpectedly before we went to visit. So, I’ve just stayed here. My daughter now lives in New Mexico and I do not enjoy the geography there. It is cooler – they have a dry heat. I still miss the mountains though. I’m thrilled that you can find solace in your sewing. You certainly are gifted at that and you bring joy to others through that avenue. You are gracious to share that talent with others. I cannot imagine your thrill at your pattern winning a 1st prize. Congrats. Again, I am thrilled that you are safe. Sometimes we all need a jolt to remember how fortunate we are. Congrats to Pam and to you as a designer on those top awards! My memories of bear cubs are little black cubs from vacations in Tennessee as a kid. Glad to hear things are returning to normal, I hope to someday visit those California parks…I’m glad you are able to appreciate the beauty in your state even after a scare. I love my life in Indiana but tourist destination…well, maybe not so much! I did wonder if you’d been affected by the earthquake, so pleased to hear you’re alright. Having never experienced one, I can’t imagine how scary it must be to find the ground around you shaking. Terrifying. To have found calm and normalcy afterwards, as well as your creativity, obviously the pluses of living where you do outweigh the cons! Soma, so glad you are alright! in Pennsylvania, we have parks but not as grand as in CA. You have to head to northern PA to see the bears. How cute is your bear design! We get lots of cold and snow in the winter and that alone would encourage you to stay in CA! The fabric line is delicious and I am not even a fan of Halloween decor! I am glad to know you are okay and that little bear is the cutest!! Sending you very good vibes for less *vibrations* in the future. Here in Oklahoma we have had a few shakers recently (I know, we aren’t supposed to have earthquakes…we get to deal with tornadoes…but it is happening anyway) so I know even little ones are kinda scary. Hope you soon feel safe and secure again. I didn’t realize you lived in the quake area. Glad to know you aer okay and apparently no major damage to your home. I like that big flower in the quilt above. Can’t wait to see what the whole quilt looks like when it is finished. I am so glad that you can find the wonderful things that surround you,… no matter where you live, Soma! So glad you are safe and getting back to normal. 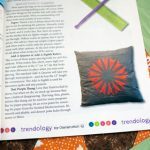 And how cool to see where Pam has brought your pattern to life in her artistic interpretation! I am sure that your art and designs bring happiness to many, many people.